SSA Soft is an integrated IT solution provider. The company is managed by a team of leading IT professionals with decades of experience at international operating levels. SSA Soft aims to deliver innovative solutions to its customers to help them enhance reach to their customers and boost productivity within their organizations. SSA Soft has successfully delivered numerous projects to customers in North America, Europe and South Asia. Projects delivered by SSA Soft include: application development and maintenance, Web/Portal Development, Testing and Quality Assurance, Information Security Reviews, Business Process Outsourcing, various products driving productivity gains for customers and a wide range of professional services. 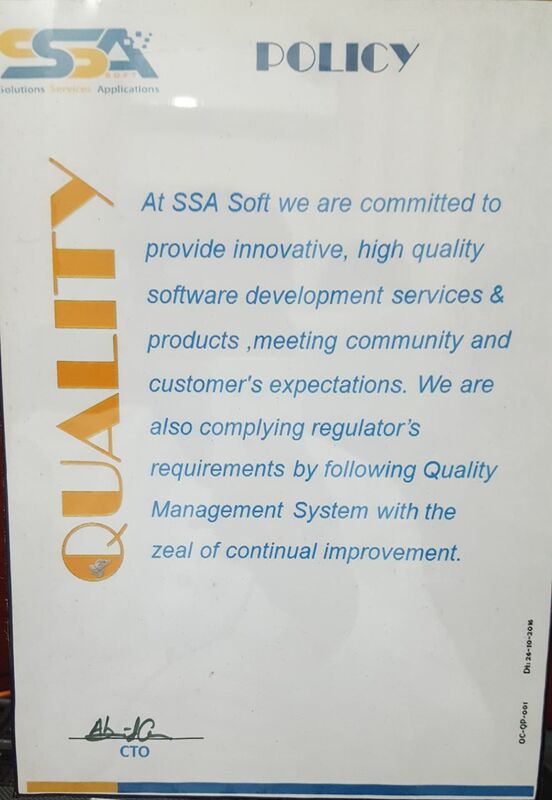 At SSA Soft we are committed to provide innovative, high quality software development services and products, meeting community and customer’s expectations. We are also complying regulator’s requirements by following Quality Management System with the zeal of continual improvement. Our Project Development Life Cycle follows the industry’s best practices, which ensures better chances of success on a project. With success, we mean on time, within budget and with quality. Once you have chosen SSA Soft for the developmental work, the next steps are simple.